Little did I know that the post I finished Sunday, to let up for a few days, would be proven prophetic 48 hours later, as reader Luis F already commented. The musings about chavismo becoming what could not dare say its name, XXI century fascism, came home today home to root with a vengeance At the Nazional Assembly, Diosdado Cabello and Pedro Carroña Carreño set up an ambush on opposition deputies to beat them up, while locking the doors so no one could escape so guards could try to stop them from taking videos of the scene. Female chavista representatives had the courtesy of being the ones beating up opposition female representatives like Maria Corina Machado. I am not going to go into the beating up details, there are articles already up, and already in English. I am just putting the basic video below where you can see clearly that Venezuelan flagged jackets wearing chavista representatives are brutally attacking opposition Representatives It says it all, this was not a "spur of the moment angst expression". Now, rather than go into the gory details that regular readers of this blog already know happened, let's try to think about the why. The first thing to note is that the Speaker, Diosdado Cabello, not selected by Chavez to succeed him, was presiding over it all, did not try to stop it, had armed body guards just in case and even laughed at the thing. So yes, he did all what a fascist would be expected to do. But surely he cannot be THAT stupid not to know that this is going to have repercussions internationally (and at home as apparently chavismo numbers would be already dropping in surveys). Why is Diosdado thus doing something which in the end can only damage Maduro as the opposition representatives are already pointing out? Well, those able to comment, because 7 are reported injured and one in a hospital tonight. We must also comment that even if Cabello and Carroña Carreño argument that the opposition representatives are in open rebellion, there are legal mechanisms available to silence them fast without having to make such a public PR disaster. What gives? Or, it is possible that a scorn Cabello, knowing that Maduro is getting ready to do him in, who knows that he is unelectable, is doing such idiotico-fascist antics to sink along with Maduro. With an even crazier variation, that he may be able to replace Maduro through a coup, because Maduro cannot silence the opposition. This has to be the reason, there is no other one that makes sense. I am open to suggestions and will add them below this line if any reader comes up with something original and believable. 1) It is possible that this hypothesis is operating as unaccountably the Venezuelan american has arrested for terrorism a rather naive "gringo" making a documentary. This last week end, pre-Tuesday night parliament battle is already picked up by a very strongly worded Washington Post Editorial that covers this week end repressive actions including the arrest of General Rivero (while the New York Times seems concerned elsewhere?). 2) In Colombia not only Uribe but now Pastrana is attacking Santos policies on Venezuela. I wonder if Chavez, before he died, thought to himself, “Après moi, le déluge” (“After me, the deluge") (“Después de mí, el diluvio”).Choose your language, though I doubt Thugo Himself used the native tongue of Mr. Danger's Gringaterra. It is certainly unraveling rather quickly. I wonder if it would be prudent for Capriles to go into hiding. The possibility of jailing Capriles- reminds me of Peron getting jailed in 1945. Not successful, as the street noise that Evita I orchestrated got him released from prison, and he soon got elected President. While the Cubans have been masterful at keeping a cowed society cowed for 50 years, they are probably out of touch in how to cow an uncowed society, as that process occurred so long ago. As a result, their advice may not be all that good in keeping Chavismo in power. I suspect that some advice the Cubans have given Maduro/Chavismo has already backfired- which explains the trip to Havana. Since Plan A didn't work as we anticipated, come to Havana/Papa and we will give you Plan B. 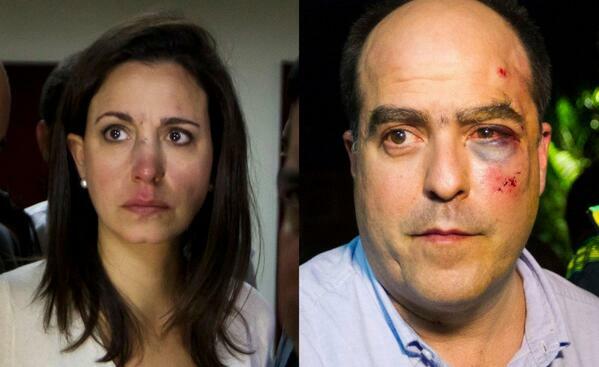 Interesting that this beating occurred soon after Maduro took a trip to Cuba to confer with his handlers. I doubt very much that the beat-down, and Diosdado Cabello's reaction to it, was something the Cubans would have advised. While the Cubans may be out of touch in how to cow an uncowed society they are still astute enough about how to maintain political power to realize this beating would not help keep Chavismo in power. I see the beat-down in the Assembly as Diosdado Cabello's message to Maduro: you may lack the smarts to blow your nose without first consulting your masters in Havana- and your masters in Havana have already given us advice that has backfired- but I can handle the oppo better on my own. You will have to go after me and the oppo. And I can handle both you, the oppo, and the Cubans on my own. Or at least so may think Diosdado Cabello. Which is the reason for Diosdado's reaction to the beat-down. Since the Cubans have shown themselves to be incompetent, by giving us advice that has backfired, I will do things my own way. One must consider the obvious possibility that these people are just rabble (chusma) and like to intimidate their opponents when they feel supported by someone strong (Diosdado). As for Diosdado, he is just another wannabe dictator, but without the charm of Chavez, the finesse of Assad, the political wit of Sadam, the histrionic accomplishments of Nero, or the physical strength of Caligula. Let's hope that Diosdado doesn't seize power away from Maduro et al. Follow the money.....cornered beasts that are deadly afraid of loosing it all if their enemies will prevail as the process is on it's deathbed. The Guardian pretends it is a brawl:both sides guilty,The Independant has an almost balaned post although like most of the press they insist in calling it a brawl and not una encerrona fascista. It is by now obvious this government does not feel the least bit secure. It knows it is illegitimate, people do not pay attention, Madurito complains the press does not give him any credit and so on and so forth. Things are going to get tougher, passive resistance stronger, a situation not unlike that of Iran except that the Venezuelan Government has not yet wasted its foreign political capital like Iran but it is coming fast. Just yesterday's Maduro,s tirade against the Minister of Foreign Affairs of Spain is showing the way ahead. Just found a good one on the web: Nicolae Madurescu. Let's just hope he and the wife end up like the originals. Nothing is worse than insecurity.It is the insecure who become the most aggressive.The same with dogs....Guard dogs are the most fearful and the most aggressive. Insecurity does not mean that they are on their way out either.Wishful thinking has been too much a part of the Venezuelan opposition. There is nothing wrong with using force, in a country where democratic methods will fail repeatedly.Of course maybe as a non Christian who does not believe in cheek turning, that is easier for me to say.I believe when we allow evil to flourish without doing whatever it takes to stop it, then we are part of the guilt.These people are bullies, and many people have allowed them to flourish.There may come a point where there is nothing that can be done.That point may have arrived...I don't know. Boludo Tejano, I understand your point about changes in time, and circumstance and you might be right, but my worry is that it simply doesn't take much to instill fear in a people who are not used to defending themselves and who have historically lived under dictatorships for so many years.The psychological seeds are well planted.I always think of Belarus in this case....these people are quite " comfortable" living under dictatorship.It is like the psyche of the government actually reflects the Psyche of the people .Those who do not fit in, of course are miserable, and many of them have already left.Those who haven't are under quite a bit of stress. The whole act was planned. Maduro in cadena, cameras turned away, sound manipulated to appear as if all was normal, and then cabello claiming all was fake. They intentionally made as much mark as they could in a short time for shock value, deny it happened in the assembly and that it was orchestrated by the opposition. This was timed for the planned marches today on May 1, knowing that it would stir the opposition into a huge protest. Chavismo would deny involvement (except they failed when they let the video escape), and that the opposition is inciting the violence that will come today allowing chavismo to take it to the next level. These guys are so f'n predictable if you reduce your thoughts to their level. Take your bloody nose out of Venezuela, shouts Nicolae Madurescu (loved that one) against Spanish prime minister that wants to assist Venezuela in trying to solve the political crisis. I see a lot of people in the streets today.... It's worrying... Capriles talks of better days ahead. That would be easy. Nothing can be worse than these very dark hours. Can they? The other day Google's CEO said something like "dictatorships will be stopped by internet" and somehow technology has been very useful to prove them wrong. Contrast yesterday between what Carroña was saying and what the legislators managed to film was incredible. If you have the stomach to see the video pay attention to the part where the malandro explain how one of the chavista members of the parlament was attacked. HOwever what you can see is the moment when MCM was attached in front of Diosdado Cabello. It's at 3:08, so start at 3:00 you can clearly see it! So what happened to the woman they say was "agredida" looks to me like she jumped on someone and then they fell without meaning to but I really can't make it out. So many thoughts come to mind. First I will say how proud the good people of Venezuela should be of the democratic representatives at the AN...they have taken all the abuse of the regime in the name of the people. I am sure most of them could have fled and live confortably someplace else...but they have stayed...willing to sacrifice all to save Venezuela. Second, I am glad Maduro just bit the hand that feed him some political oxygen. Spain was one of those countries that recognize him, remember? Spain is such a political prostitute selling to the highest bidder, I am glad they got a nasty reaction from maduro for offering to be "negotiators". Which goes to tell you there is no negotiation, compromise, or semblance of limitations in the plans of the regime. They are going all out. I hope the AN reps take the case to OAS, I know they won't get much from Insulza and "his" assembly, but it will force everybody to publicly announce on what side of democracy they are. I noticed yesterday reading some headlines how some media would report the incident as a brawl (pelea) and others as an attack (agresion). I hate that media outlets are more and more outrageous propaganda machines...not even making an attempt at reporting, but spinning the news. El Pais in Spain one of the first one to use "brawl" to report it. Sometimes I feel that trying to "accertain" what was in the mind of one of those chavista idiots that led them to do something outrageous, is like trying to accertain what is in the mind of an earth worm that made them decide to cross the sidewalk. I really think that many things they do they do out or pure idiocy, no plan, no ideas from Cuba, no tactical moves, no strategic plans...plain and pure stupidity...just because they can. In my opinion, stupidity is the real reason behind this actions. Diosdado has always been a thug and he has never understood politics. I think that is one of the reasons he had disagreements with Chavez whom he view as too soft against the opposition. He could never understand why Chavez wasn't more authoritarian. What we're witnessing is Diosdado Unleashed. Maduro OTOH has no way of controlling Diosdado and no idea what he wants to do anyway if he could. Good post this morning on Gustavo Coronel about the cuban participation in the attack in the assembly. "Gordo matón de la Asamblea Nacional parece ser cubano!" Wearing the Venezuelan flag jackets no less. Is there any doubt remaining that this was not planned?